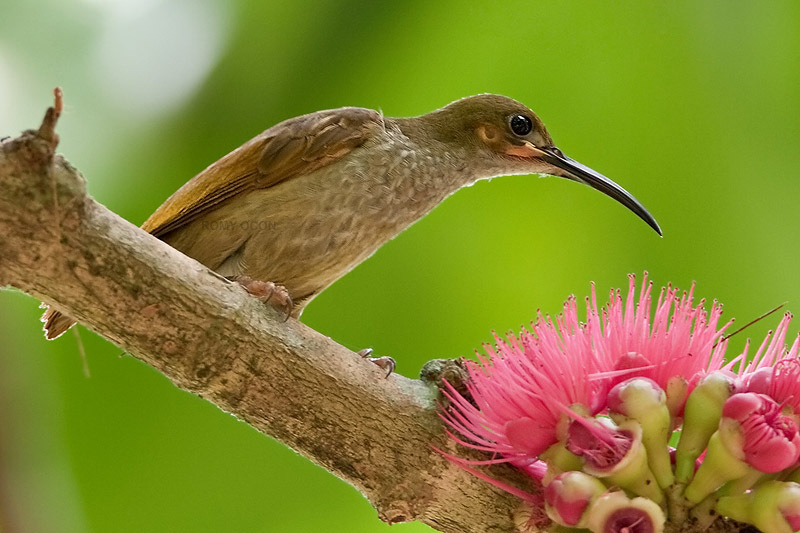 Measuring about 172 mm (6.75 inches) from tip of tail to tip of bill, the Naked-faced Spiderhunter is the largest sunbird in our islands. For comparison, many of our sunbirds are barely 4 inches in total length, with a few reaching between 4 - 5 inches. This bird is found only in the Philippines. I was staking out a blooming macopa tree (Syzygium malaccense) at Mt. Makiling way back in 2006, the site being a virtual feasting area for many species of sunbirds and flowerpeckers, when I saw this individual foraging among the photogenic macopa buds and flowers. It was the first time I saw this species in the wild, and naturally like any other birder I was mesmerized and almost frozen motionless with the endemic lifer encounter. I'm glad though that I recovered enough of my senses to manage firing some shots at the active bird. The low light under the canopy forced me to use a slowish shutter speed, so many of the shots were blurred. This photo is among the ones that came out recognizeable. Shooting info - Mt. Makiling, Laguna, Philippines, May 11, 2006, Canon 20D + EF 500 f4 L IS + Canon 1.4x TC II, 700 mm, f/5.6, 1/80 sec, ISO 800, 475B/3421 support, manual exposure in available light, major crop.